Boss Justin Edinburgh says he is delighted with ‘excellent’ facilities at the Cobblers Oliva Nova training base in Spain. The squad arrived at their hotel on Sunday at the Oliva Nova complex, which us 50km north of Benidorm on the east coast of Spain, and underwent their first training sessions at the nearby sports centre on Monday morning. The players trained outside early in the morning, and will undergo another session this evening, and Edinburgh says the setting is pretty much perfect. “I am really delighted with the facilities,” said Edinburgh on Monday afternoon. “We have trained twice this morning, out on the pitch which is excellent, and then into a fantastic gymnasium and did another workout in there. And he added: “We are mindful of the heat, but the players did a lot of really good work out on the pitch. The bulk of the squad have already done more than two weeks of fitness work at club’s Moulton training ground so are in pretty good shape already, and Edinburgh made it clear a lot of the work on this trip will be with the ball at their feet. 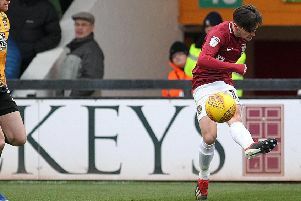 “We are going to do a lot of football work, a lot of technique work, and we are going to start to work on some shape and formations,” said the Cobblers boss. Edinburgh has already stated that he feels there is a more positive atmosphere among the squad, and his short time with the players in Spain has strengthened that belief. “I have a good feeling about this group, and there is a real togetherness there,” said the Town manager.